The femur is the largest bone in the body of most species, carrying the weight and power of the animal's body. 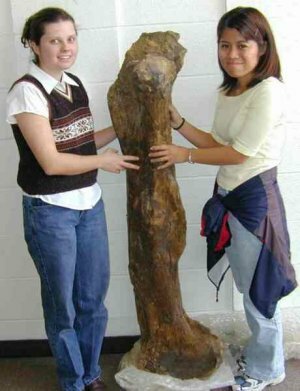 The femur shown is one of the largest ever found from Edmontosaurus. This bone supported a huge hadrosaur, perhaps more than 30 feet in length. The crest along the right side anchors major muscles of the leg. The femur shown is 137 cm long (54 inches). The same bone in your body is about 15 inches long.